https://harmonypublicschools.network/hspaustin-new/wp-content/uploads/sites/102/2019/03/alarm-clock-1.png 488 500 Central Office https://harmonypublicschools.network/hspaustin-new/wp-content/uploads/sites/102/2017/10/HS-Endeavor-Austin-White-Letters-logo-white-300px.png Central Office2019-03-08 10:58:362019-03-08 11:06:58Spring Forward! https://harmonypublicschools.network/hspaustin-new/wp-content/uploads/sites/102/2019/03/Its-Social-Media-Day-1.png 800 800 Central Office https://harmonypublicschools.network/hspaustin-new/wp-content/uploads/sites/102/2017/10/HS-Endeavor-Austin-White-Letters-logo-white-300px.png Central Office2019-03-07 09:40:392019-03-07 09:47:25We Want Your Feedback! https://harmonypublicschools.network/hspaustin-new/wp-content/uploads/sites/102/2019/01/Advocacy-Post.png 800 800 Central Office https://harmonypublicschools.network/hspaustin-new/wp-content/uploads/sites/102/2017/10/HS-Endeavor-Austin-White-Letters-logo-white-300px.png Central Office2019-01-28 09:45:232019-02-27 11:03:02Make Sure Your Voice is Heard! 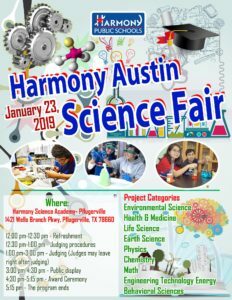 Join us Wednesday, January 23rd for our most anticipated annual Harmony Public Schools Austin District Science Fair! HPS Austin middle and high school students will present their science investigations to a panel of judges from 1:00 – 3:00PM. The public is welcomed to view the student’s projects after that time. At 4:30PM the Awards Ceremony will begin to announce the category winners that will then advance to the city-wide science fair. *Judges will need to arrive by 12pm to review judging procedures. Lunch will be provided. Judges are free to leave after all project judging has been completed. We invite our judges to join us for the remainder of the program and Award Ceremony. https://harmonypublicschools.network/hspaustin-new/wp-content/uploads/sites/102/2019/01/Feedback-Harmony-Website.png 800 800 Central Office https://harmonypublicschools.network/hspaustin-new/wp-content/uploads/sites/102/2017/10/HS-Endeavor-Austin-White-Letters-logo-white-300px.png Central Office2019-01-10 11:42:162019-02-27 11:03:43We want your feedback! Harmony School of Endeavor – Austin is seeking dedicated Bilingual and ESL teacher.